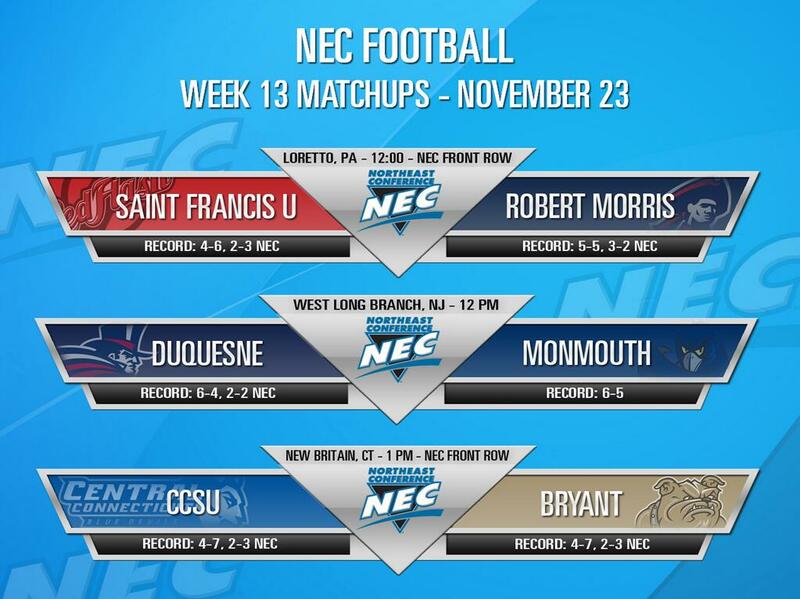 Four #NECFB representatives have made the final cut. Kyle Harbridge, RJ Noel, Dillon Buechel and Mark Nofri are all finalists in The Sports Network’s major FCS awards program. Harbridge is a candidate for the most-prestigious FCS honor of them all – the Walter Payton Award. Named in the memory of Sweetness, the award goes to the top player in FCS annually. The fifth-year running back for Saint Francis has certainly made a case for the Payton Award. Harbridge was not on the preseason Watch List, but forced his way into the mix with 100-yard rushing games against James Madison, Georgia Southern and Fordham in September. Kyle Harbridge, SFU’s all-time leader in all-purpose yardage, scored his program-record 21st rushing touchdown on a 50-yard sprint in Week 3 at JMU. Noel and Buechel, both first-year starting quarterbacks, are candidates for the top rookie honor in FCS – the Jerry Rice Award. After leading Sacred Heart to an 8-game turnaround, Nofri should be amongst the top vote-getters for the Eddie Robinson Coach of the Year award. The four-time NEC Offensive Player of the Week stands tied for second in FCS, and eighth in NEC single-season history, for rush yards (1,509). Produced seven runs of 50 yards or more, including six of the 10-longest runs by a NEC rusher this season. Responsible for the NEC single-game rushing high (291) in a near-upset of No. 12 Fordham. 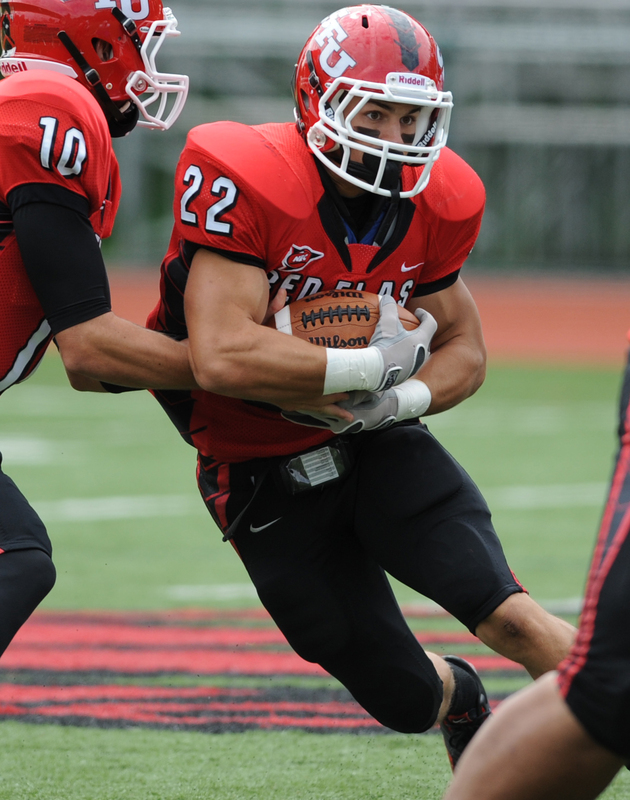 Harbridge had touchdown runs of 67, 2 and 71 yards, the last of which gave Saint Francis a 20-17 lead. Reached the 100-yard mark in non-conference road games against Georgia Southern and James Madison, both of whom were ranked in Top 25 at the time. Carried Saint Francis to a 24-10 win over NEC champion Sacred Heart, rushing for 190 yards and two touchdowns against a run defense that ranked fourth in FCS at the time. The redshirt freshman led his team to a 10-2 overall record and its first NEC title since 2001. The dual-threat threw a NEC-best 23 touchdown passes to only 7 interceptions. He also ran for 7 touchdowns, including a 66-yarder in a road win at Patriot League member Lafayette. He leads the NEC in total offense (2,702). His 2,037 pass yards rank third and his 665 rush yards are sixth. Noel, who displayed great ability to effectively manage the game, was responsible for 30 touchdowns, while committing only 10 turnovers (7 INT, 3 fumbles lost). He has not lost a fumble in his last six games. Noel was only sacked nine times this season and was not sacked in any of his last four games. Leads all NEC quarterbacks in pass yards (2,346) and completion percentage (58.7) this season. Started all 10 games for Duquesne as a rookie, posting a 6-4 overall mark and helping the Dukes capture a share of the Northeast Conference crown. His 234.6 pass yards per average ranks second amongst FCS freshmen and 25th overall. The two-time NEC Rookie of the Week eclipsed the 300-yard passing mark in a win over CAA member Albany (309) and a setback at No. 15 Youngstown State (362). Responsible for 70 percent of Duquesne’s offensive output. 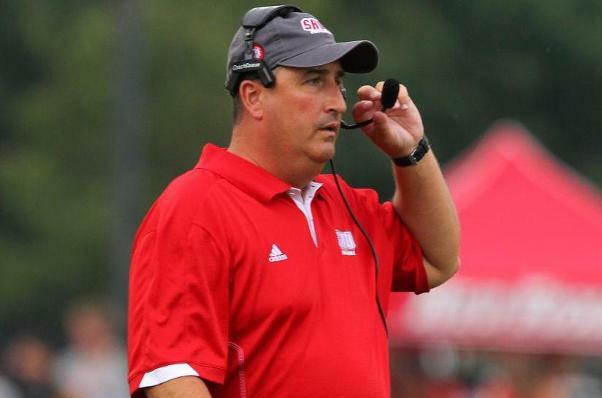 In his second season on the job, Nofri presided over the top turnaround in Division I FCS. After finishing 2-9 in 2012, SHU went 10-2 and earned the program’s first-ever FCS playoff bid this season. Despite being picked last in the NEC preseason poll, and starting a rookie quarterback, Nofri’s team delivered Sacred Heart’s first conference title since 2001. Sacred Heart was a perfect 6-0 in non-conference play, including road wins over Marist, Lafayette and Bucknell. Pioneers lead FCS in turnover margin (+22), while ranking 11th in run defense () and 13th in rushing offense (235.8 ypg). Sacred Heart is the NEC’s top-ranked team in both scoring offense (35.5 ppg) and defense (20.0 ppg allowed). Their 432 points scored are second-most in program history. In his second season at the helm, Mark Nofri has watched the Pioneers go from worst to first. Of course, Christian Kuntz and his Duquesne teammates would rather be preparing for a FCS playoff game instead of preparing turkey this week. At least for the Dukes, the turkey will taste rather juicy this year. Duquesne closed out its season, celebrating its second NEC co-championship in three years by downing FCS independent Monmouth on the road. Kuntz, who played like a man possessed for much of the afternoon at the Jersey Shore, made 4.5 tackles for loss, including 3.5 sacks, in the 33-23 triumph. The stellar effort earned the sophomore a share of The Sports Network’s National FCS Defensive Player of the Week award. Kuntz joins a list of three Sacred Heart Pioneers as NEC athletes who have earned national weekly honors from The Sports Network this season. Click here for The Sports Network’s complete list of weekly winners. The sophomore linebacker spent a lot of time in Monmouth’s backfield during Duquesne’s 33-23 road win in Week 13. Harassing Hawks’ signal caller Brandon Hill for much of the afternoon, Kuntz recorded a NEC single-game season high 3.5 sacks. Kuntz totaled 10 tackles (9 solo) and made 4.5 hits for a loss. Kuntz was active during crunch time. After a Dillon Buechel touchdown pass broke a 23-23 tie early in the fourth quarter, Kuntz and Co. responded by halting Monmouth on the ensuing possession. He broke up a 2nd-down pass intended for Monmouth receiver Neal Sterling and his half-sack on a 3rd-and-18 play forced the Hawks to punt. The second-year Duke stunted a potential first-quarter scoring drive by sacking Brandon Hill for a 10-yard loss on a 3rd-and-8 play from the Duquesne 26-yard line. 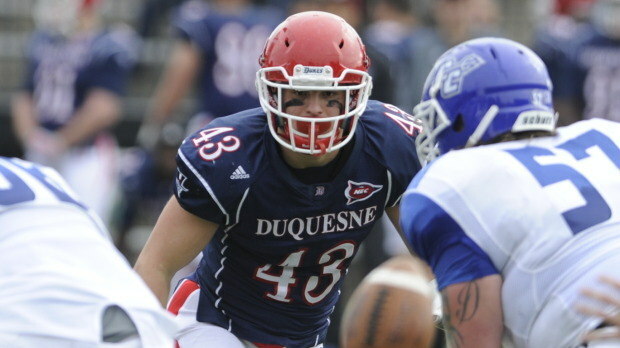 He delivered another key hit with Duquesne protecting a 13-7 lead in the second quarter. With Monmouth facing a 2nd-and-8 from the Duquesne 20, Kuntz dropped Hill for a 9-yard loss and essentially forced the Hawks to settle for an unsuccessful field goal try. He finished the season with team highs for both tackles for loss (19.5) and sacks (9.0). The defensive tackle was an absolute menace during Sacred Heart’s 56-28 road win over NEC rival Bryant. Spending much of the day in Bryant’s backfield, Moore logged 6.0 tackles for loss in helping Sacred Heart move to 7-1 overall. Moore, who finished with eight total tackles, levied 3.0 sacks on the Bryant quarterback and produced another 3.0 loss-incurring hits as part of SHU’s stout run defense. The Pioneers limited Bryant to only four (4) yards rushing, the lowest total in a Northeast Conference game since 2006 and the 15th-lowest total in league single-game history. Moore’s hits for a loss helped force Bryant into 3-and-out situations on four occasions. Only two of Moore’s eight stops did not result in a loss, but both tackles were difference-makers. He stopped the Bryant ball carrier for no gain on a 2-and-8 play on the Bulldogs’ opening possession of the game and the potential scoring drive ended on downs two plays later (Moore’s quarterback hurry forced an incompletion on 3rd down). With SHU protecting a 21-0 lead late in the second quarter, Bryant’s Michael Perry gained two yards before Moore jarred the ball loose and SHU recovered at the Bryant 42-yard line. Moore forced a quick Bryant punt on the opening possession of the second half when he sacked Mike Westerhaus for a 9-yard loss on 2-and-9. The redshirt freshman signal caller was responsible for five touchdowns and 310 yards of total offense in Sacred Heart’s bounce-back win over Nutmeg State rival Central Connecticut. Noel rushed for one score and finished the game 17-of-25 passing for 297 yards and four touchdowns. The five touchdowns that Noel was responsible for are the most by a NEC player in a single game this season and the 310 yards of offense stand as the second-highest total in a 2013 conference contest. By the early minutes of the second quarter, Sacred Heart held a 28-6 lead over CCSU and Noel already had three touchdowns to his credit. His 16-yard touchdown pass to Moses Webb opened the game’s scoring 3:49 into the first quarter. Noel scored on a 1-yard rush with 00:11 remaining in the opening period and added a 30-yard scoring strike to Greg Moore with only 2:11 having gone by in the second. The third-year Pioneer cornerback thwarted four Lafayette drives in Sacred Heart territory during Saturday night’s final-second road win over the Patriot League member. Thomas came up with eight tackles, two interceptions and one forced fumble (which was recovered by SHU) to help the Pioneers achieve a 2-0 season start for the first time since 2008. Both interceptions came with Thomas defending Preseason All-Patriot League receiver Mark Ross. Thomas’ first pick came on a 2nd-and-6 from the SHU 34-yard line with 5:07 left in the first quarter of a 7-7 game. He again went up and took the ball away from Ross midway through the third period, making the interception at the goal line as the Leopards threatened to erase a 14-10 SHU lead. Thomas cancelled out a long gain on Lafayette’s first drive of the second half when he forced a fumble inside the SHU 35-yard line after a 21-yard gain by Justin Adams. Thomas also made a huge contribution on run defense, making a touchdown-saving tackle on 3rd-and-Goal from the SHU 2 on the final play of the first quarter. Following his Week 5 performance at Bucknell, Sacred Heart cornerback JD Roussel was named College Football Performance Awards‘ National Defensive Back of the Week. Roussel made three interceptions to lead a swarming Sacred Heart defense that blanked Bucknell, 16-0. The cornerback made three tackles and became the first player in Sacred Heart’s Division I history to pick off three passes in the same game. With his help, Sacred Heart limited the Bison to 164 yards and blanked an opponent for the first time since October 5, 2002. Roussel’s first interception came with Bucknell driving late in the first half. On a 1st-ando-10 play from Sacred Heart’s 40-yard line, Roussel pulled in Trey Lauleta’s pass at his own 25. The senior denied Bucknell again on its first possession of the second half, picking off a deep ball in the end zone. His final interception allowed SHU to set up in victory formation and ice their fifth straight win. How have the five Preseason All-NEC selections performed thus far this season? Robert Morris’ Artemis Spanou, Saint Francis’ Alli Williams, Mount St. Mary’s Sydney Henderson, Sacred Heart’s Gabby Washington and Bryant’s Naana Ankoma-Mensa have been living up to their preseason billing over the first few games of the 2013-14 campaign. All five women rank amongst the NEC’s top-eight scoring leaders, while Spanou and Williams ranks amongst NCAA leaders in a couple of categories. Spanou, who recorded her NEC-record 27th straight double-double performance in last week’s win over UMBC, leads Division I in rebounding (16.0 rpg). Her 19.3 points per game rank fourth in the NEC. Williams catapulted herself into the NEC scoring lead with her 40-point showing in a 92-79 win over East Tennessee State. Her 24.8 ppg average ranks 11th amongst the NCAA’s top scorers. She is also amongst national leaders in steals, ranking third with a 4.5 spg average. Williams is only one of four NEC players in the last 15 years to reach the 40-point mark in a game, joining a distinguished group that features former Red Flash stars Jess Zinobile and Beth Swink, both of whom are in the NEC Hall of Fame. Washington (19.8 ppg) leads Sacred Heart in scoring for the second straight season. The two-time all-NEC guard is also the team leader in rebounding (6.8 rpg). Henderson has gotten off to hot start for the Mount, scoring at a blistering pace. The native Virginian has reached the 20-point mark in five of the season’s first six games. Only Lehigh held Henderson under 20, but the 5-foot-6 sparkplug still scored 19 points against the Mountain Hawks. Her 22.3 ppg are second-most in the NEC. Ankoma-Mensa is averaging a double-double through Bryant’s first five games. Her 13.0 ppg and 10.0 rpg are both team highs. Safety Gordon Hill was somewhere on the New Jersey Turnpike when Week 13 kicked off. Assistant coach Justin Embler had his feet up in front of a TV.